Figure 10: A novel pattern with 7-stars. The design in the centre, resulting from the natural extension of star edges, leaves behind disproportionate octagons. The design on the right, constructed manually, corrects this by redistributing the area to new 5-stars. Our software implementation and the technique on which it is based allow access to a wide variety of designs without offering so much flexibility that it becomes overly easy to wander out of the space of recognizably Islamic patterns. There are, however, opportunities for future work that do not compromise the focus of the system. The set of available tilings from which to form patterns is open-ended. More tilings could be implemented. Some new ones can easily be derived by inspection of patterns in Bourgoin or Abas and Salman. 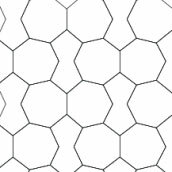 We could move away from periodicity by implementing aperiodic tilings with regular polygons. 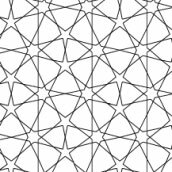 Castera has constructed several ingenious aperiodic Islamic star pattern based on Penrose rhombs . Finally, the hyperbolic plane offers tremendous freedom in the construction of tilings with regular polygons. We hope to adapt the technique described in this paper to the Poincaré model of the hyperbolic plane, much the same way Dunham has done with Escher patterns . One last aspect of the system we hope to improve is the naïve extension of lines into interstitial regions. Our algorithm can easily fail to produce attractive results. In Figure 10, a novel grid based on regular heptagons is turned into an Islamic pattern by placing stars in the heptagons. The natural extension of star edges into the gaps leaves large, unattractive octagonal areas. With the appropriate heuristics, our inference algorithm could detect cases such as this and add some complexity to the inferred geometry in order to improve the final design.